An exhaustively researched, largely successful attempt to analyse the subversive qualities inherent in the horror cinema. Towlson presents his study chronologically, beginning with Frankenstein (1931) and Freaks (1932) — the first two horror films that could truly be considered subversive, the former with its sympathetic monster the embodiment of the downtrodden working man of the Great Depression, the latter a challenge to accepted notions of eugenics — before taking in Val Lewton’s 1940s horrors (Cat People, 1942; The Curse of the Cat People, 1944); Herman Cohen’s sci-fi /horror/teen films of the Cold War period (I Was a Teenage Werewolf, 1957; Blood of Dracula, 1957); the grim generational-conflict British horrors of Michael Reeves (Witchfinder General, 1968) and Pete Walker (Frightmare, 1974); and through to the Vietnam/Watergate era American nightmares of Night of the Living Dead (1968), The Last House on the Left (1972) and The Texas Chain Saw Massacre (1974). This is territory that has been comprehensively explored by the likes of Robin Wood, Kim Newman and David J. Skal (Skal’s 1993 book The Monster Show is one of the most important studies of the horror film ever written), but Towlson goes further: later chapters cover the anti-Reaganomics scenarios of Henry: Portrait of a Serial Killer (1986) and American Psycho (2000); the ‘splatstick’ cycle epitomised by Frank Henenlotter (Basket Case, 1981), Peter Jackson (Bad Taste, 1987) and Brian Yuzna (Society, 1989); before bringing it right up-to-date by examining the ‘anti-new Puritanism’ of Teeth (2007) and American Mary (2012); and the post-9/11 apocalyptic landscape of 28 Weeks Later (2007), Survival of the Dead (2009) and Stake Land (2011). 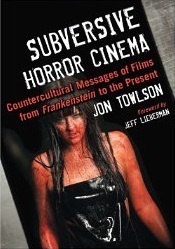 Towlson also focuses on specific filmmakers who deliberately set out to create works of subversive terror: Tod Browning; Wes Craven; David Cronenberg; Tobe Hooper; George Romero; James Whale; and Jeff Lieberman, an often neglected director whose excellent LSD nightmare Blue Sunshine (1977) is covered in depth (Lieberman also provides the foreword to this book). Not every reader will agree with Towlson’s choices but the debate is a healthy, constructive one and ensures that this thoroughly detailed and enjoyably written book is an important addition to the continually expanding list of studies devoted to genre film theory.